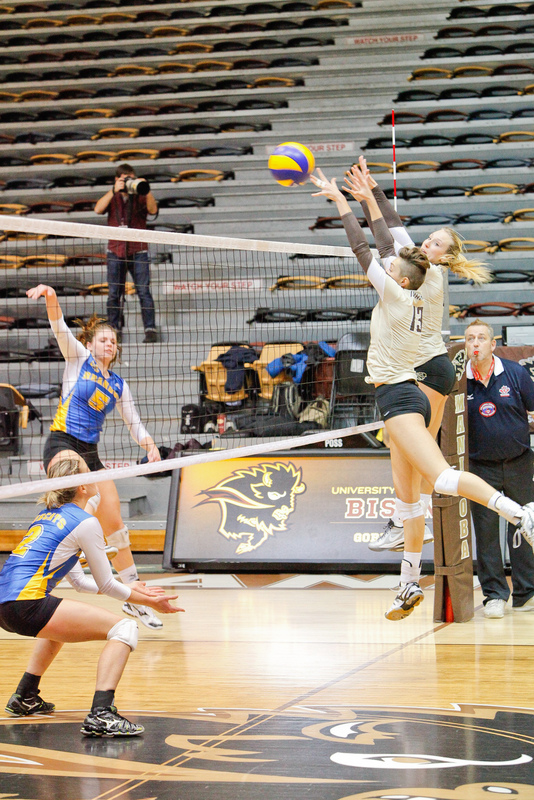 The Manitoba Bison women’s volleyball team got two huge wins over Mount Royal when the Cougars made their first visit to the U of M campus since joining the Canada West conference last season. 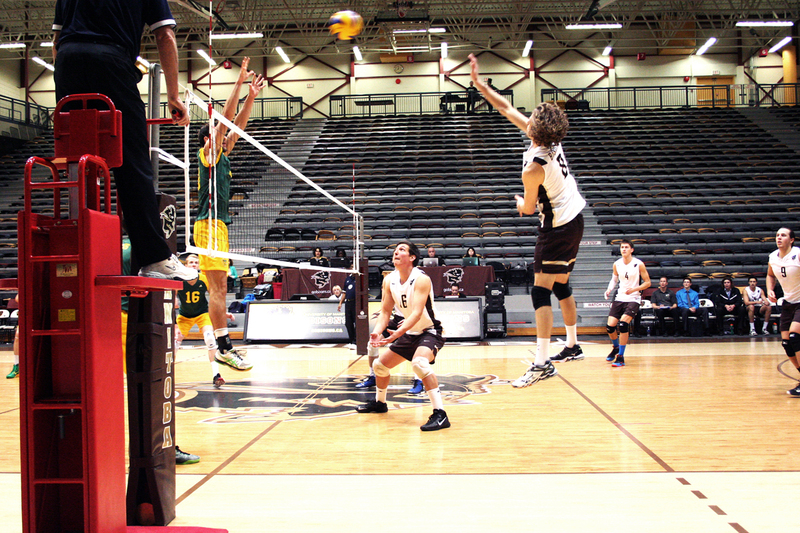 The Cougars swept the Bisons last season in two five-set matches played in Calgary. Manitoba entered Friday’s match shorthanded; the flu bug had bitten third-year Rachel Cockrell, who leads the team in kills this season. With Cockrell out of the lineup, the Bisons pushed past the Cougars 3-1 (25-21, 15-25, 25-19, 36-34) in front of a crowd of fans that featured the growing contingent of rowdy Big Horns. The Bisons jumped out in front early in the first set. The Cougars evened things up at 9-9, and the two teams continued to duel for control over the next 12 points until the Bisons managed to pull away. The second set was dominated by Mount Royal. Cougar Julia Pasieka pitched in with four of her team-leading seven block assists. She also had four kills as Mount Royal took an early lead and held on to tie the match at one set apiece. Manitoba dominated the third set, taking an 18-point lead at one point. Mount Royal managed to close the gap considerably but could not stem the Bisons’ momentum. The match came down to a thrilling fourth set, which had the crowd at the Investors Group Athletic Centre rocking until the final point. After the previous two sets had been blowouts, the fourth proved to be a true test of stamina and determination. The teams went well beyond match point, battling tooth and nail for the key set. The Bisons and Cougars exchanged the lead 13 times after the Bisons first reached match point 24-22. On their ninth attempt to put the match away, a kill by Taylor Pischke set up match point, where Jordana Milne and Brittany Habing made the match-winning block for Manitoba’s 36th point of the set. The following evening was an easier night for the Bisons. Cockrell was back in the lineup and contributed 11 kills in a straight-sets victory, 3-0 (25-18, 25-15, 25-20). Pischke—who is nominated for the Manitoba Sportswriters & Sportscasters Association Female Athlete of the Year award—was the top Bison on the weekend, accumulating 32 kills and 22 digs over the course of seven sets. After Friday’s game, coach Bentley spoke about the team’s current status. After cheering on the Bisons to victory through their epic fourth-set rally against the Cougars, Bentley had a lighthearted message for the students who are a part of the Big Horns. Currently sitting in fourth place in the Canada West conference, the Bisons have six matches remaining to improve their playoff position. You can catch the final home games of the 2013-14 regular season with the Big Horns on Jan. 31 and Feb. 1 as they host UBC Okanagan.